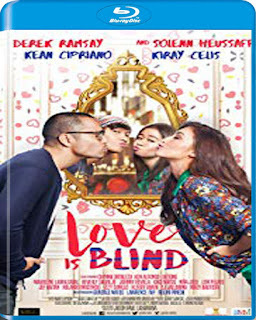 Love is Blind is a 2016 Philippine fantasy-romantic comedy film directed and written by Jason Paul Laxamana and produced by Regal Entertainment Inc. The film stars Derek Ramsay, Solenn Heussaff, Kiray Celis and Kean Cipriano. It was released on February 10, 2016, under Regal Films. In Love is Blind, the main character, Fe, played by Kiray Celis, uses a magic potion that causes her handsome crush Wade (Derek Ramsay) to see her as more attractive than she actually is.